A beaver from Western Sweden - Forest ebeaver is a radio-controlled bio-energy harvester which harvests bio-energy wood both in young-growth forests and on wet terrain, with minimal impact on the environment. A prototype of Forest ebeaver was shown for the first time at the Elmia Wood Fair in 2009. After the fair, this prototype was put to work in actual bio-energy production at JD Skogskonsult, to test and gain knowledge about ebeaver’s abilities in order to build a machine high in reliability, quality, performance capability combined with low fuel consumption - important qualities for a machine that harvests green energy. In the Spring of 2010 at the Elmia Bio Energy Fair, the first Forest ebeaver made its premier. The bio-energy harvester Forest ebeaver fells and bunches energy wood out to the skidding row through working in a shuttle-system between the skidding rows. A big advantage of this system is that you can place the skidding rows where the terrain is the most suitable. 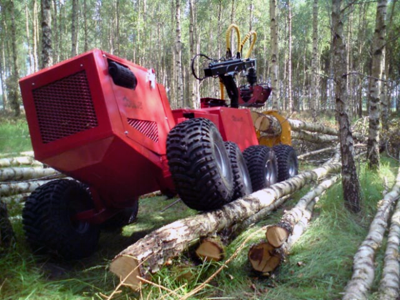 A forwarder equipped with a grapple saw takes the wood from that point to the landing; alternatively the wood can be chipped directly in the forest. The concept allows for an easy switch between bio-energy harvester head and for example a grapple bucket. Equipped with an grapple bucket, Forest ebeaver is a very smooth forest ditch maintenance machine. A brush clearing head mounted on the tip of the crane is coming soon. One of Forest ebeavers important characteristics is it’s ease of transport. Because ebeaver only weighs 2100 kilos, it can easily be transported on a car trailer behind a pick-up truck. The hydraulic system is run by a 21,7 kW Kubota diesel engine. The maximum flow is 96 liter/min and the maximum pressure is 240 bars. Forest ebeaver will be present at both the SkogsElmia and SkogsNolia Fairs. The ebeaver is developed and manufactured in Karlsborg, Västragötaland, Sweden.